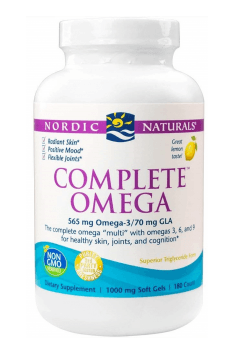 Nordic Naturals Complete Omega is a dietary supplement containing a non-concentrated, naturally balanced blend of fatty acids: omega-3 (EPA and DHA), omega-6 (GLA), and omega-9 (oleic acid), obtained from pure, fresh oil from cold-water fish (sardines, anchovies) and cold-pressed borage oil. The capsules stand out thanks to their delicious lemon flavour that masks the typical fish taste of fish oils. The preparation has a beneficial effect on the functioning of the cardiovascular system as well as on the mood and cognitive performance, and the addition of gamma-linoleic acid (GLA) supports joint function and improves the condition of the skin. Omega-3 fatty acids can be synthesised from alpha-linolenic and linoleic acids in the presence of the enzymes desaturase and elongase. Unfortunately, the efficiency of the two enzymes is rather low and further decreases with age. Consequently, in order to achieve proper levels of essential polyunsaturated omega-3 fatty acids, they must be delivered with food. Their food sources can be cold-water fish, such as mackerel, herring, sardine or salmon, as well as linen seeds, walnuts, or chia seeds. The compounds of that group, both included in this supplement, are docosahexaenoic acid (DHA) and eicosapentaenoic acid (EPA), whose beneficial effect on the body has been confirmed by research multiple times. Omega-6 fatty acids are represented in the supplement by gamma-linolenic acid (GLA). It is considered to be a conditionally essential acid but just like omega-3 acids, the organism cannot produce its sufficient amounts. GLA is extremely important for the skin – it helps to maintain its proper nutrition and protects it from external factors. Moreover, it is used as an aid in the treatment of atopic dermatitis. Examples of food products containing a lot of GLA are: blackcurrant, primrose oil, hemp oil, or borage oil, which was used in this supplement. Omega-9 fatty acids, that is essential polyunsaturated fatty acids, are represented by oleic acid (OA). It is naturally produced by the organism and has powerful anti-inflammatory properties. OA can reduce cholesterol levels and arterial blood pressure, as well as displays anticancer properties. When it comes to external sources, its large amounts can be found in rapeseed oil, walnut oil, or almond oil. It is also present in borage oil. Omega-3 acids can reduce inflammation in the organism, a condition that can lead to many serious diseases in the long term. Research has repeatedly proven that they reduce the levels of interleukin 6 (IL-6), IL-8, IL-10, homocysteine, or the tumour necrosis factor alpha (TNF-α). Additionally, the action of omega-3 acids is reinforced by gamma-linolenic acid (GLA), which, similarly to omega-3, increases the concentration of anti-inflammatory eicosanoids. Omega-3 acids help to improve the functioning of the cardiovascular system by, for example, reducing arterial blood pressure, and lowering triglyceride and cholesterol levels. The effect of improved health parameters is further improved by the synergy of its activity with oleic acid, which also helps to keep the heart healthy and reduce the risk of cardiovascular diseases. Docosahexaenoic acid (DHA) forms phospholipids found in cell membranes and constitutes about 60% of all the fatty acids contained in them. It is essential for proper brain development and the functioning of nerve cells. Another compound used in this supplement, oleic acid, participates in the formation of neurolemmas. They are a form of nerve fibre protection. The combination of both fatty acids can delay age-related deterioration of cognitive functions and reduce the risk of neurodegenerative diseases. Omega-3 acids help to maintain emotional balance. They have a positive effect on well-being, reduce mental tension, as well as lower aggression in stressful conditions. The addition of GLA and oleic acid contributes to the lowering of excitability and the improvement of concentration in people with ADHD. EPA and DHA have also been observed to reduce the symptoms of depression. Oleic acid and omega-3 fatty acids can help to reduce abdominal obesity, which is often an indication of metabolic disorders. Moreover, the substances improve glucose tolerance and reduce insulin resistance, that way contributing to a decrease in blood glucose levels. Too high a blood sugar level is toxic and can lead to damage in the kidneys and nerves and increase the risk of cardiovascular diseases. Omega-3 acids reduce inflammation connected with the excessive exposure of the skin to UV radiation and protect it from burning. GLA helps to maintain proper skin hydration and prevent its dryness, thanks to which the skin is radiant, smooth and firm. GLA from borage oil has been shown to support the combat against eczema, that is skin changes connected with inflammation on the surface of the skin. GLA and omega-3 efficiently reduce inflammation in joints as well. The acids have been demonstrated to relieve, for example, rheumatoid arthritis (RA) by reducing pain and facilitating everyday functioning. To sum up, Nordic Naturals Complete Omega is a supplement with high-quality omega-3 acids enriched with gamma-linolenic and oleic acids in lemon-flavoured softgel capsules. The synergic action of the acids efficiently supports the functioning of the cardiovascular system, helps to fight inflammation, and keeps the skin firm and healthy. The supplement additionally helps to stay in a good mood, protects the nervous system, and improves glucose metabolism. Take two softgels daily with food or as directed by your doctor. Due to the great number of health-improving properties, the product is recommended to everybody; however, it can prove particularly helpful to seniors, in whom the natural production of DHA and EPA has decreased. Depending on the purpose of supplementation, dosage can range from 1 g to even 10 g daily. I recommend that you begin supplementation with 2 capsules daily, as instructed by the producer, and increase the dosage if needed. In order to keep the product fresh and prevent oxidation, store it in a dark and cool place and protect from high temperatures. No gluten, milk derivatives or artifical colors or flavors.